The Google Pixel is a great phone – so good in fact that we gave it four and a half stars in our review. It will continue to be a smart option, as it supports Android P. As a Google handset it’s also got a big name behind it, and like any big-name smartphone there’s a wide range of cases available for the Pixel. These range from the sleek and minimalist, to the strong and bulky, to multi-purpose cases, arty covers and more, so there’s sure to be one that fits your needs and tastes. The Spigen Liquid Crystal case has a lot going for it, starting with the fact that it’s very cheap, which is handy for anyone who’s already stretched their budget buying the Pixel. But despite its low price the Liquid Crystal is well-designed, with a slim and light form-fitting build, that maintains the shape of your handset, and being transparent it also maintains the Pixel’s looks, so if you’re a fan of the phone’s unusual metal and glass design you won’t have to hide it away. It’s not the most protective case around, but it’s easy to put on, resists smudges and should keep your Pixel safe from minor scrapes and falls. Another Spigen case, but this one has a little bit more going on. You lose the slim transparent design of the Liquid Crystal case, but in its place you get a case which has passed military grade drop tests (which apparently means being dropped 26 times from a height of 48 inches and surviving). The Spigen Rugged Armor achieves this thanks to a spider web pattern and air cushioned corners on the inside of a TPU shell. The case isn’t much to look at, but textured carbon fiber accents mean it’s more than just a nondescript black block. Cases that offer lots of protection are usually bulky as all get out, but Caseology has basically mastered the art of doing the exact opposite. This dual-layer case protects the Google Pixel at every angle, even lifting the screen off a tablet to avoid micro scratches, and it looks good to boot. This case's price has fallen since it debuted, meaning that it's now very affordable to pick up one of Caseology's Parallax cases in the color of your choice on the cheap. The VRS Design High Pro Shield isn’t the slimmest case around, but it’s thinner than you might expect given the level of protection it provides. The case is certified as offering military grade protection, so you can feel confident that your Pixel is safe, and while made of plastic the High Pro Shield sports a brushed metal effect that helps it stand out from the crowd. Speaking of metal, there’s also a metal kickstand built in, so you can prop your phone up when watching movies. If only real leather will do, then check out the Tetded Cowhide Leather case. It’s one of very few genuine leather Pixel cases at time of writing, and predictably you do pay a premium for it. But the case undeniably looks good, with a slim profile that avoids adding too much bulk, and a microfiber lining to keep your screen protected when the case is closed. If you want a case that’s guaranteed to be a good fit, then look no further than the Pixel Phone Case. This is created by the same team as the Pixel itself, so it fits like a glove. It also comes in a range of colors to suit almost any style and provides three layers of protection, with a silicone exterior for shock absorption and grip, a polycarbonate core for support and a soft microfiber interior. Making a case stand out, without making it look weird, can be a tricky job, but we’d say the Incipio Carnaby succeeds, as on top of the fairly standard plastic shell there’s a layer of cotton, which looks different (in a good way) and makes the case soft to the touch. Available in three distinct shades, the Carnaby is also strong and shock absorbent, so as well as looking good it does the vital job of keeping your Pixel safe. OtterBox is a big name in cases and for good reason, with its Commuter case providing serious levels of protection. An inner rubber cover and outer polycarbonate shell provide two layers of protection, deflecting shocks away from your phone, while port covers keep dirt and dust out. All of which sounds great on paper, but OtterBox has extensively trialled the case, over more than 238 hours and 24 tests, so you can be sure it lives up to the billing. Most cases are quite plain, but the Artworks Live Case isn’t most cases. As an official Google case you can be confident that it’s well-built, but the real selling point is the ability to apply an artwork to it, for a truly eye-catching cover. There’s a fairly wide range of images available to choose from, and you can position your artwork of choice however you want on the case, for a unique, custom finish. 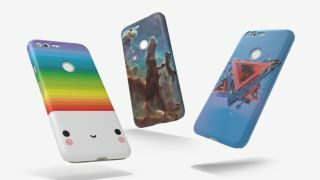 If you want even more creative freedom than Google’s Artwork cases offer, then check out the Photos Live Case. This is a similar idea, except you can upload one of your own photos as an image for the case, meaning the possibilities are endless and your Pixel can truly reflect you. Or if you’re lacking inspiration you could look at the Places Live Case, which lets you select a location from Google Maps, then pick from a range of styles and colors to print it in.